The smallest bonded winery in Loudoun County, and perhaps the entire state of Virginia, is Zephaniah Farm Vineyard. Located just south of Leesburg, the family operated operation is also situated in one of the oldest structures hosting a winery: an 1830 manor house. In fact, the building was constructed by William Benton, who also built James Monroe's Oak Hill estate 10 years earlier. The house and surrounding dairy farm was purchased by William Hatch in 1950 - basically to keep his children occupied during his travels as a Naval Intelligence Officer. Capt. Hatch's military career could be a character in a Tom Clancy novel. During World War II, he served as an underwater demolitions diver, helping to clear the Chesapeake Bay and the Charleston harbor of mines laid by German submarines. After an officer heard him singing a Polish rhyme he was sent to the Naval Academy, commissioned as an officer, and was deployed to a U.S. minesweeper with a Russian crew in Murmansk. Eventually, he was assigned to the U.S. Embassy in Moscow for the remainder of the war. After the war, he joined Naval Intelligence and served in the Pentagon and throughout the war. Coincidentally he was the person who first notified Admiral John S. McCain, Jr. that his son was shot down in Vietnam. Getting back the farm, Zephaniah Farm actually - named after William Hatch's grandfather shipbuilder Zephaniah Hatch, operated as a working dairy farm until about 20 years ago. At the same time as market conditions forced the closing of the dairy farm, William's son Bill began researching grape growing and envisioned planting a vineyard on the property. Long after the diary operations switched to raising beef cattle he planted Cabernet Franc, Chardonnay, and Chardonel vines in 2001 and waited for the fruit. The Chardonel never fully prospered but the other two varieties did and after a few years harvest he started making wine for home consumption. In 2007, they bottled their first commercial product, the 2007 Cabernet Franc. Mr. Hatch believes his cabernet franc can distinguish itself from the many other excellent brands in the state, because he actively prunes the leaves at berry set so that there are only 2-3 shoots per foot. His winery consultant and son, Tremain Hatch believes this approach produces a less herbaceous flavor and instead allows the fruit flavor to stand out. He also recommends not "over-oaking" their Cabernet Franc so the wine is aged in neutral French oak. After gaining a masters degree in Viticulture at Virginia Tech and upcoming field work in New Zealand - Tremain should have plenty of additional advice for his father. Other family members also contribute to the success of the winery. Bill's wife Bonnie designed the wine label and daughter Meredith assists in bottling and winery\vineyard tours; her twin sister, Emily, sometimes travels home during heavy bottling sessions. A true family enterprise. The 2007 Cabernet Franc is a nice wine, the first sensation noticed is the strong fruity nose. The wine itself, is very smooth with more black cherry than red cherry flavor. The tail is also smooth with low tannins. Bill also provided us with barrel samples from a couple styles of oak and it was a nice exercise to taste how the oak influences the wine. The Cabernet Franc definitely needs a little more time in the barrel, but look out for a Merlot that is aging from grapes sourced from neighbor Bill Tripplet. After only a few months in the barrel - that wine is drinkable now. Over the coming few years Mr. Hatch hopes to improve the quality of the Cabernet Franc while simultaneously introducing new varietals such as a dry Petit Mensing and a Petit Verdot. In the meanwhile the winery is open by appointment, but the Hatch's encourage visitors. The only reason they don't provide set hours for tasting is that with a staff of one or two, they are usually in the vineyard or the basement laboratory. Just give them a heads-up and ring the family heirloom above the door when you arrive. This is a bell that was salvaged from the S.S. Monticello, a boat built by Zephaniah Hatch, but named after his hometown of Monticello New York and not the Jefferson estate. The Zephaniah wine is also available at the Leesburg Farmers Market, held every Saturday morning - regardless of weather. For the past six months we have been trying to find a suitable replacement for the Old Dominion Brewing Company's Ashburn brewpub - which closed suddenly last year. We enjoyed visiting the brewpub since it provided good food, better beer, was within range for lunch outings, and was close to the bike path. A perfect stop while\after biking. 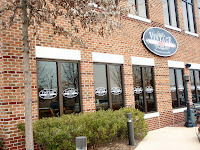 We recently learned about Vintage 50, located in Leesburg, which meets or exceeds all the requirements. Even though it is a little farther out , it is less than a mile from the bike path and serves better food and beer. The beer is brewed by Bill Madden - who helped launch the Washington D.C.'s popular brewpub Capital City Brewing. At Vintage 50 he has expanded the number of offerings to include more unique beers from English and Belgium traditions. Although one of our favorites was the lighter German inspired Catoctin Kolsh. This is a smooth drinkable ale. Getting back to the Belgium ales, the Saison V-50 was excellent - strong spices and aroma as was the E.S.B Extra Special Bitter. They offer several other styles, a Porter, an Alt beer, a couple Stouts, and possibly the Wee Heavy Ale - Scottish recipe. Try the sampler - its well worth the price. We brought two samples so that we could try all 14 beers. Like the Old Dominion Brewing Company, Vintage 50 sells all the beers in Growlers - so fill up. The chocolates are amazing - our favorites being the Sur De Lago and the Burnt Caramel. Being a wine site we also paired them with a couple wines. In Missouri, wineries often offer chocolate when pouring Norton so we opened a bottle of Röbller Vineyard Winery 2002 Norton. Even after 6 years in the bottle, this Norton retained it grapey flavor but lost all acidic properties. Since the wine hadn't evolved into a spicier flavor, like many aged Norton tend to do, the wine was better paired with the more herbal samples. On the other hand, Ridge Vineyards zinfandel based Three Valleys was more interesting with the pieces with more chocolate flavors. Regardless, this could be one of the best product samples we have received. Each sample was unique, made from quality ingredients, and made us desire more after the box emptied. Recchiuti ships anywhere so we are looking forward to more of their Sur De Lago and the Burnt Caramel as well as the S'mores Kit and Key Lime Pears. I have been drinking Maker's Mark for a number of years now, and a few months back I signed up for their Ambassador program. As an Ambassador, you receive a number of benefits in return for promoting the bourbon to others. The coolest benefit is having your name posted on a barrel and then having the ability to taste and purchase the bourbon when it reaches maturity. The Maker's Mark Ambassador Web site also includes links to stories about the distillery; the Samuels family; special events; and, of course, the status of your barrel. Now, Maker's Mark is quite unique from other bourbons and not just from their trademarked red wax seal. The bourbon consists of iron-free limestone water from a neighboring spring fed lake. The distillery does not use rye, which they feel leaves too much bitterness on the tongue and instead uses locally grown red winter wheat in conjunction with the corn. They feel this combination provides a smoother flavor, plus the grains are softly crushed with an antique roller mill which doesn't scorch the grain. The final ingredient, the yeast, is a special strain developed by the Samuel family and produced directly at the distiller. The mash is distilled twice, first in an all-copper column still at 120 proof, and then a second time in a copper pot still at 130 proof. This low distillation proof preserves the natural flavor of the corn and wheat. Then, after the spirit is stored in white oak barrels, these barrels are rotated within the warehouse in order to help create a consistent flavor. So that's the story why Maker's Mark differs from other bourbons. We will continue to post on the status of our barrel as we sip it from our red wax dipped glass. Like the New York State Agricultural Experiment Station, the University of Minnesota instigated a grape breeding program to assist wine growers in their state cultivate grapes that can survive in the rugged Upper Midwest environment. One of the most successful graduates from this program is the Frontenac grape, which was introduced in 1995. It is a cross of the French hybrid Landot 4511 and Vitis Riparia (the most widely distributed of all native North American grapes). This grape combines extreme cold hardiness with a high level of disease resistance and produces wines with an attractive garnet color and a pleasant cherry aroma and taste. It quickly became the most widely planted grape in Minnesota and is becoming more popular throughout the Midwest. The grape’s major shortcoming is that its high acid content requires malolactic fermentation to achieve a drinkable wine. One Minnesota winery that cultivates Frontenac is Falconer Vineyards and Winery. Located just 10 miles from the city of Frontenac (the grape’s namesake), this winery has operated for over 14 years. The winery grows Frontenac because of the grape’s tremendous vigor - it can grow wildly if not properly managed. In fact, according to John Falconer, wild riparia grapes near the vineyard run to the top of 40 foot oak trees and Frontenac displays some of that vigor. Thinning the fruit has the added affect of lowering the grape’s acidity to more appealing levels. In addition to its vigor, the Frontenac grape is extremely versatile. Falconer Vineyards currently makes four styles of wine from Frontenac: Frontenac Rose, Frontenac - medium bodied, Frontenac Reserve - full bodied, and Frontenac Port. The Frontenac Rose is produced from the immediate crush juice and the winery is able to elicit a long strawberry finish. For the past two years, this wine has sold out by mid-summer. The medium bodied Frontenac is made from juice with a 5-7 day skin contact during fermentation. Their signature wine is the Frontenac Reserve, which is made from juice with a 9-11 day skin contact during fermentation. This wine is then stored in Minnesota oak barrels and Mr. Falconer believes this wine has great aging potential. The Frontenac Port was created from this year’s harvest and will be available in a couple of years. The winery will age the wine in oak barrels for 2 - 3 years before release. The Minnesota wine public has quickly accepted Minnesota grown wine and Frontenac. After opening their tasting room last year, Mr. Falconer noticed that the general public did not realize that Minnesota vineyards could grow quality wine grapes. One year later he has noticed a sea change in the consumer’s knowledge. Visitation rates are much higher than the previous year as groups of consumers travel between several wineries – with many repeat customers. In fact, Mr. Falconer has heard several wineries report that this year has been the best year on record for sales a trend which should ensure that Falconer winery continues to sell out their Frontenac stock each year. Another Minnesota winery, Fieldstone Vineyards, started cultivating Frontenac primarily because it had a steady supply of vines from neighboring growers. Fieldstone is a new winery although their vineyard is located on a 100 year old farm and their winery is situated in a 75 year old barn. The owners are pleased with their decision to cultivate Frontenac since the grape’s versatility has allowed the winery to use it in five separate offerings, ranging in styles from dry – medium bodied reds to semi-sweet rosé wines. Each style has been successfully welcomed by the Minnesota wine public and this success is demonstrated by the number of awards earned by these wines in the past two years. The Frontenac Reding Reserve (a dry-medium bodied red) has won several awards at the Minnesota State Fair Commercial Wine Competition as did the Minnesota Glacial Rock Red (100% Minnesota Frontenac). The 2003 Martell Frontenac (a vineyard specific 100% Frontenac) won gold at the 2004 American Wine Society competition and finally, their 2003 Frontenac Rosé earned 1st place at the Minnesota State Fair Commercial Wine Competition (Rosé division). The biggest difficulty the winery has encountered with Frontenac is alleviating the high acidity associates with hybridized grapes. It continues to be an ongoing educational process both in the winery to bring the acidity down and to teach wine lovers about the differences. Regardless, the winery is very pleased with the University of Minnesota’s efforts to create hybridized vines/grapes and believe that newer releases such as Frontenac Gris, LaCrescent, Prairie Star and Marquette will "allow the bar to be raised in cold climate viticulture to even higher levels". Nearby in Illinois, Galena Cellars Winery and Vineyard produces a port-style Frontenac Port dessert wine. The wine is made from 100% Illinois grown Frontenac grapes which has a berry - chocolate complexion. The wine is very popular in the Midwest where it won multiple Double Gold medals - most recently at the 2008 Illinois State Fair. Materella Winery, located just north of Warrenton Virginia. Luckily business brought us to the region and we allocated a few hours to visit this boutique winery. Kate Marterella first planted vines about eight years previously in her vineyard. She started with Vidal Blanc, Cabernet Franc, and Chambourcin and later expanded the acreage to include Pinot Grigio, Merlot, and Petit Manseng. After harvest, the grapes are shipped to nearby Prince Michel Winery where they are crushed, fermented, aged, and bottled. Nice to have friends in the industry. Marterella also purchases grapes from Virginia vineyards in order to fill out her portfolio. On our visit, Kate was pouring ten wines, evenly split between reds and whites. We started with the dry Vidal Blanc which is unique in that the wine possesses flavors of red apples instead of the expected green apple. The winery offers two chardonnays, the Barrel Select fermented and aged completely on French Oak and the Vintage 2006 where 75% was aged in oak. Thus the both contain characteristics of oak aged chardonnay - but neither possess the oaky buttery finish present in many chardonnay wines. Their Pinot Grigio is made completely to Kate's tastes, dry and slightly acidic - but a small creamy finish. Interesting for a wine aged in steel. We normally don't care for Pinot Grigio, but this is an exception. Moving on, the Rosalie’s Rose is a semi-dry wine made from primarily Merlot that exudes strawberry. This wine helps in the sweet wine market but should also be acceptable for dry wine lovers - we brought a bottle home. The vintage Merlot is a little young and acidic - apparently due to the 20% Petit Verdot and may need more time in the bottle, but the Cabernet Franc is ready now. Its a smooth, full bodied wine made from estate grown grapes. Black cherry is prevalent throughout particularly in the tail. Another smooth wine which we also purchased was the vintage Sangiovese. This is an old world wine, "rustic" is a proper marketing term. Finally, Kate obliged us by opening a bottle of her 2003 Meritage, a true Bordeaux blend of Cabernet Franc, Merlot, Petit Verdot, and Cabernet Sauvigon. This is a big wine - full bodied but incredibly smooth. Ah, if it was only within our budget. We finished with two semi-dessert wines, the Vidal Blanc\Riesling Grace and chambourcin based Sweet Nothings. Both are not as sweet as the 6.9% r.s. would suggest and apparently sweet wine drinkers can finish an entire bottle of each in one sitting whereas the dry wine drinkers sip sparingly. We liked them both, the Grace a little more with its strong apple flavors. Sadly, there's a cloud hanging over the winery. The neighboring home owners association is maliciously attempting to bankrupt the enterprise through litigation. Apparently Kate's neighbors do not appreciate a vineyard\winery in their backyard and have promised to litigate Kate until she closes. What's significant in this affair is that the entrance to Mediterranean Cellars is less than 100 yards from Marterella's entrance and Mediterranean is not being sued. And Kate planted her vineyard before Mediterranean even opened and the entrance to that winery is on her property. Yet the home owners association is only going after Marterella. Socialism at its finest. 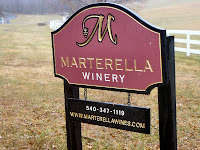 There is a jury trial scheduled for June to determine if Marterella can remain open - so until then show your support for Virginia agriculture and wine and visit the winery. We will also see how serious the state of Virginia is in promoting grape growing and wine making. Good luck Kate. 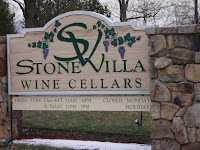 During another trip to Seven Springs, we visited the closest winery from the West, Stone Villa Wine Cellars. The winery is a short 20 minute drive from the resort and is a nice alternative when the legs get tired or the lift lines too long. Stone Villa opened 8 years ago, after Randy and Debbie Paul planted vineyards on the surrounding hillsides. The winery and tasting room were built by Randy's construction company and his father, James, finished the stonework. His creative masonry skills gave birth to the winery's name. And the facility is quite impressive. Even though the winery is located in the middle of the Laurel Highlands, almost all their wine sales comes through the tasting room. And during our visit their was a constant stream of customers. The winery grows 12 varieties of grapes that are used to produce almost 20 different wines. In many instances the winery also purchases grapes from other Pennsylvania vineyards to supplement their harvest. With that number of wines, there's bound to be a wine for everyone - particularly when the styles range from dry to sweet. Having three tasters, we tried most of them. For dry white wines they produce the Villa White a blend of Chardonnay, Seyval, and Vidal Blanc. The later grapes provides a slightly sweet sensation even though the residual sugar reading is zero. The dry Riesling is also nice, but we preferred the semi-dry version. Another off dry wine we enjoyed was the Padre's Rose - made from the Steuben grape - but with only a slight foxy character. Their Padre's Red was another interesting labrusca blend - where the Concord is very prevalent. Their best sellers are these sweeter wines, which include a semi-sweet Riesling, Niagara, Pink Catawba, and Villa Sunrise. These wines are sweet - but not gritty. However, of all the wines, we enjoyed the dry reds overall. Their single varietal Chambourcin was very good - medium bodied with cherry flavors as was the Cabernet Sauvignon with its peppery finish. Then there were the blends. The Vintner's Select is a blend of Pinot Noir and Shiraz; the Palocitro Reserve a blend of Cabernet Sauvigon and Dechaunac; and the Stovilli a blend of Shiraz and Dechaunac. You don't see these combination's that often. Our favorite was the Palocitro Reserve - dry, full of flavor, and very smooth. The Vintner's Select had the most fruit flavor and also a smooth finish. These are the types of interesting wines we seek when exploring wineries. Although Stone Villa gets winter traffic from the surrounding ski resorts, the summer time might be the best time to visit. During that season, they host music events in the evening on their patio overlooking the pond. That would be a relaxing experience.